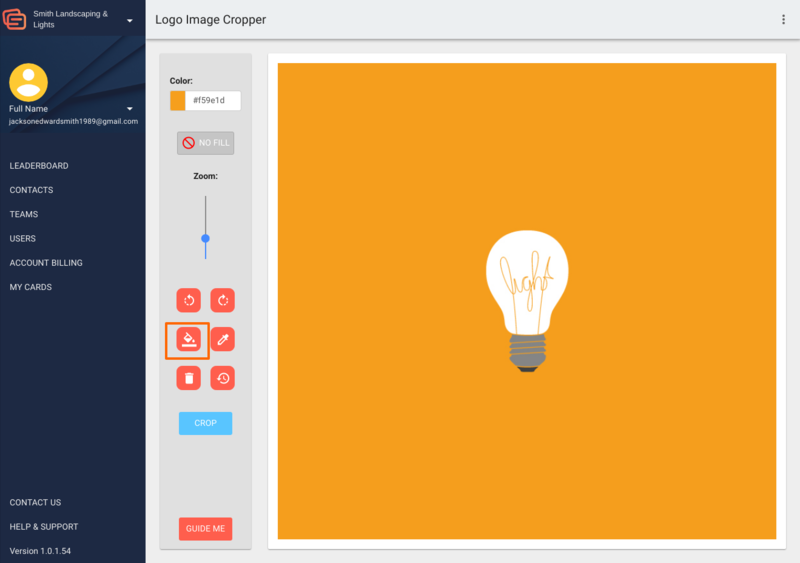 Creating a card template is different from using the desktop card editor. For details on using the desktop card editor, please view a future guide. TIP: Remember that templates will be available for all teams below the team they are created in. So, if you create a template for a team that has several subteams, the template will be available for those subteams. However, if you create a template for a subteam, it will not be available for the team above it. 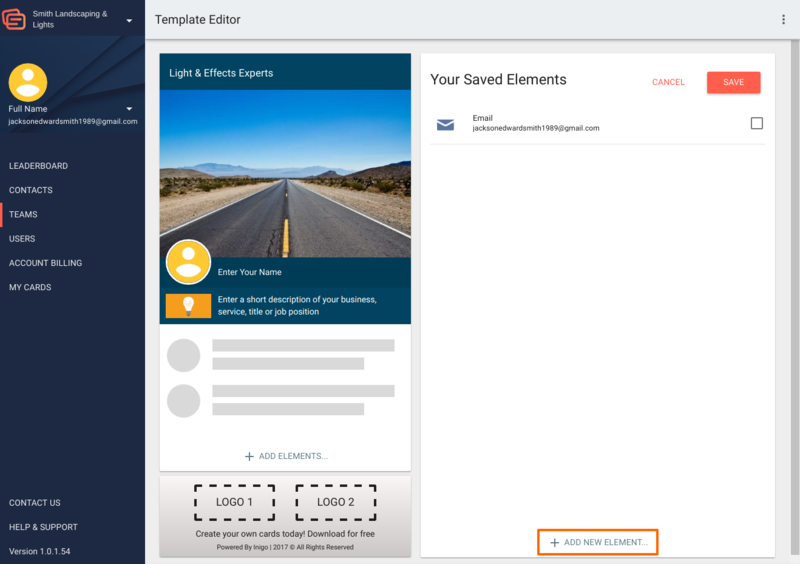 Create a card template that your whole team may use to share branded content and elements, as well as add their own unique details. 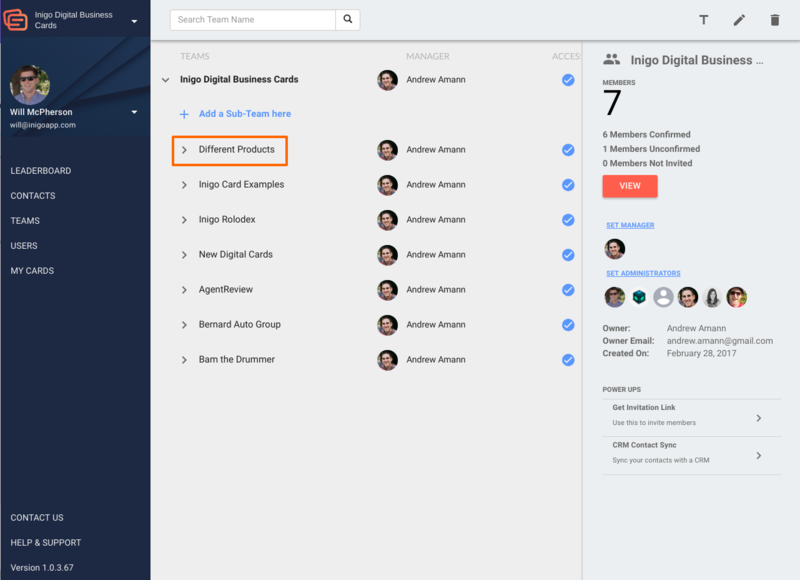 To create a card template, first, log into your Inigo Team account, and go to the "My Teams" page. Double-click on the team that you wish to create a template for, or select "view". 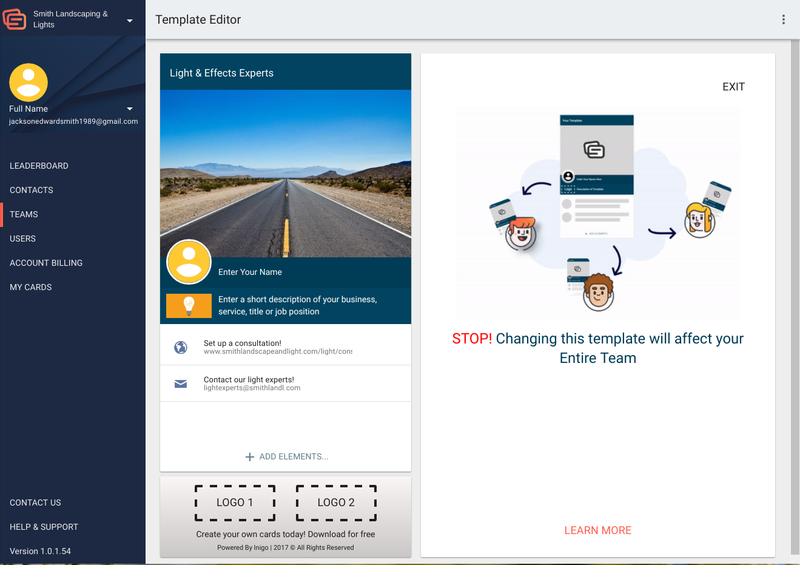 On this page, you will see existing team templates as well as team members. Select "add new template" in order to open the template editor. 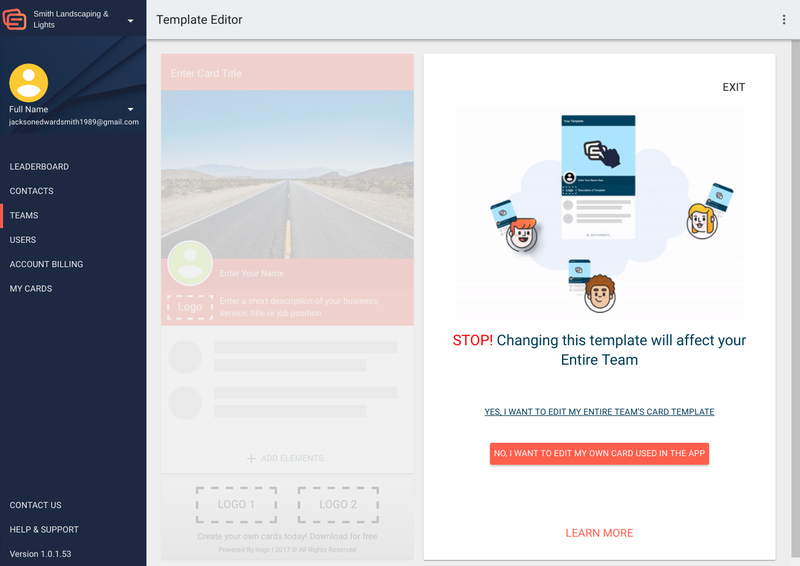 The next page will ask if you would like to edit templates for your whole team. Note that if you are editing an existing template, the edits that you make will affect every card that uses that template on your team. Click "Yes, I want to edit my entire team's card template" in order to continue. Welcome to the template editor! Here you can create beautiful card templates for your whole team. Remember that templates will only be visible to the team members in that team folder and the subteams of that folder. If you would like to see a video explanation of adding a background or logo, click here! Next, click the "Logo" space on the card template. Look to the bottom of the editing screen, and select "Add custom logo." In this page, we will edit and crop a logo to fit perfectly on the card template. 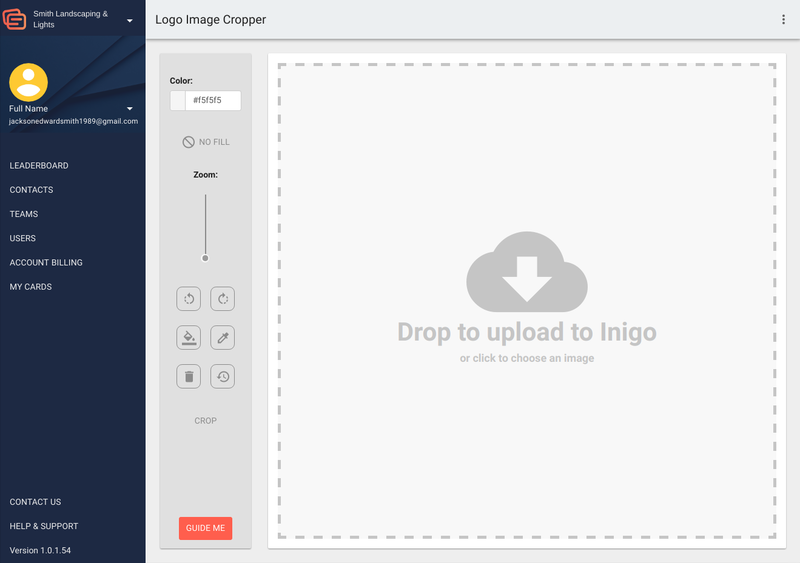 Click the cloud to upload, or drag and drop a logo to edit. Because we will use a crop tool to select the right dimension for our logo, we are going to first make sure that the background is the same color. 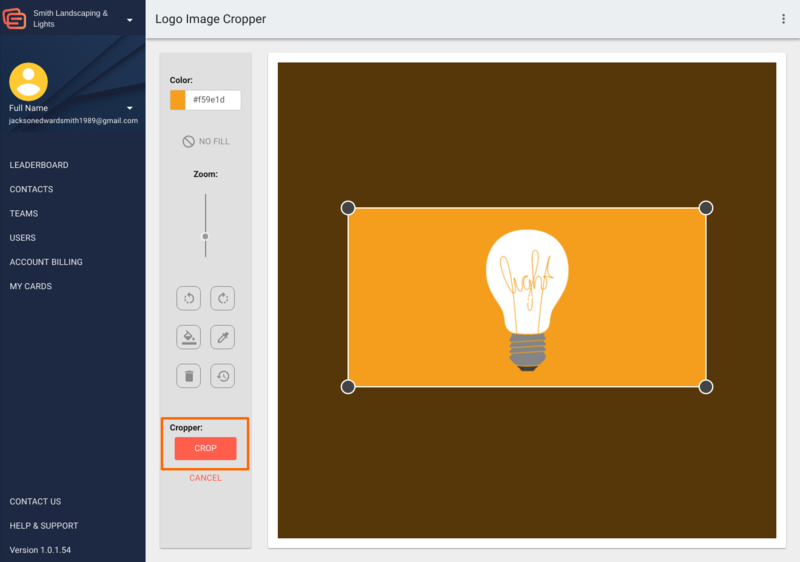 Select to "color grabber" tool to find the color of your logo's background. Once you have the specific color saved, choose the fill background button to fill the area outside of your logo with the same color. Now that everything matches, we are ready to crop the image. 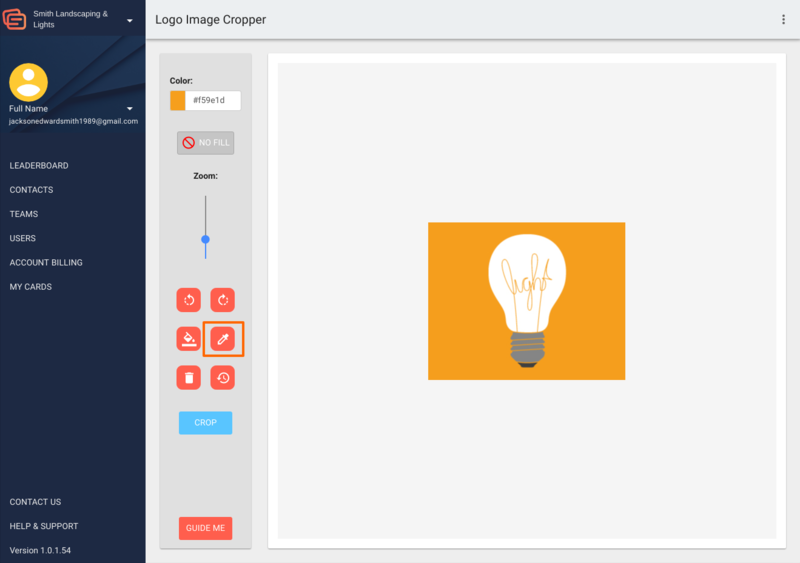 Select the crop tool, and make sure that it is centered on your logo. Press "crop" to finish editing the logo. If the logo looks great on the next page, click "okay save" to add it to your card template. Remember that this is a shared team template and that you will add your own unique elements to your own card on the Inigo app. 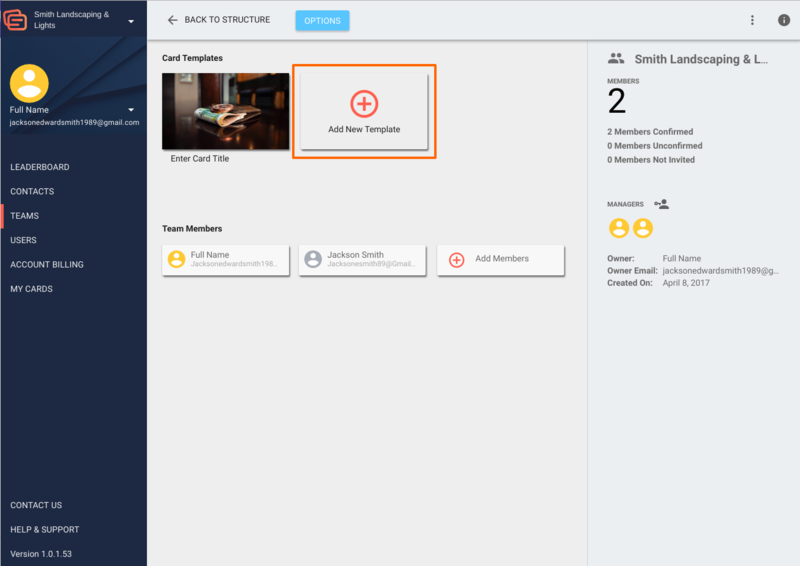 To add shared elements, select "add elements" on the left screen, and then "add new elements" on the right screen. There are a few specific elements that I know we can add to this card for the example "Light & Effects Experts" subteam. Let's say they share one contact email account and a URL landing page for appointments. I can add these shared elements. If the users would like to add their individual contact information on the app, they can do that too. I can also change which elements are in effect for this template and which are not by checking the box next to them. This template is finished for now. Your changes will be saved automatically, and you can click "Exit" to return to the team pages. Remember that this template will be found in the team folder which you created it in. Creating templates can help your team members to get active faster! Create uniform, branded designs that will make your whole team look great together.